Investors and speculators using the Internet as an investment tool will find that the Forex market offers several advantages over futures trading. *200:1 is the entry leverage value. Brokerages will have margin calls set at different levels, exact leverage may vary. **The traders cost of doing business is called the Spread. It is the difference between the bid and the ask price on your chosen currency pair. The benefits of spot Forex (cash market) over futures, and more specifically currency futures, are considerable. The dissimilarities between these investment vehicles range from philosophical - such as the history of each, their target audience, and their relevance in the modern Forex markets, to more tangible issues such as transactions fees, margin requirements, liquidity level, and the technical and educational support offered by the providers of each service. The spot Forex market, or the cash market, is certainly the most liquid market in the world. Of course, with such incredible volume comes incredible liquidity. To seasoned traders this means one thing: better execution. 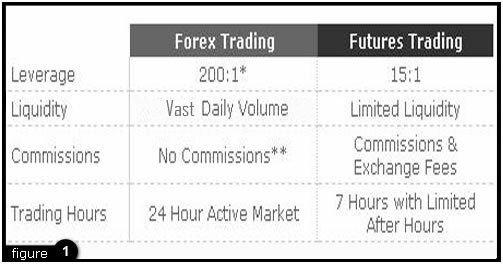 After hours trading in the Futures market has several limitations. In the US, for example, equities and futures traders have access to ECNs (Electronic Communications Networks), also known as "matching systems". These networks are established to provide a method for traders to buy and sell amongst each other. Such networks are usually not able to offer as tight of spreads as would be offered during normal market hours, thus most trades are not executed at a fair market price, subsequently there is no guarantee that every trade will be executed. Currency futures quotes are inversions of the cash price. For example, if the cash price for USD/CHF is 1.7100/1.7105, the futures equivalent is .5894/ .5897 (a format only familiar to future's traders). Spot prices, on the other hand, offer a simpler look at the market. The bid price is always shown on the left and the ask price on the right. The value of the base currency is always 1 (one). In the example above 1 US Dollar (USD) = 1.7100 CHF. Currency futures' prices also have the added complication a forward Forex component that takes into account a time factor that is not necessary in the cash Forex Market.